Quilt Story: First Friday Giveaway Day! Hey friends!! So it's the First Friday of the month, which means it's giveaway day!! Hooray!! So check out all the awesome shops, they've got new lines, deals and fun things going on. At the end I'll have a question for you, leave a comment with your answer and you're entered into all the giveaways, it's that easy! Thanks so much for supporting us and these great shops, we sure do appreciate it! Connecting Threads is giving away a fat quarter sampler of both palettes of their new Neutral Love II collection—a total of 49 fat quarters. Established in 1994, Connecting Threads is a family-owned and operated company that exists to inspire, support and supply quilters with everything they need for this wonderful craft. The company strives to ensure that every element of their product offerings are of the highest quality – both in manufacturing and in design. 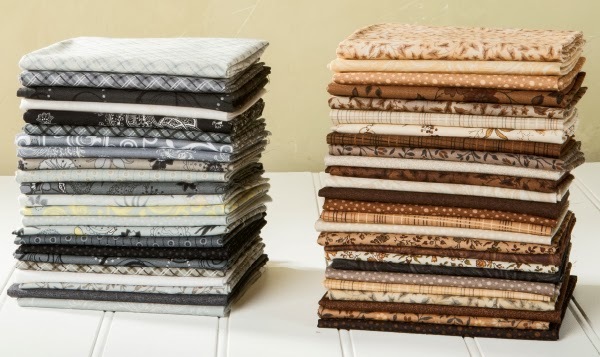 The prize value of both samplers combined is $73.01, but you can buy the fabrics individually for just $5.96/yard. We really don't. Other than remind the kids to wear some green. They always prefer to wear sneaky green so they can pinch someone back! Fat Quarter Shop is giving away the new Zinna Mormor bundle by Lotta Jansdotter for Windham! This is a Fat Quarter bundle of 11. Yum! Wow thanks for the fabulous giveaways...YES we do have traditions, since I married into an Irish family, (hence the last name Connors) Every year we do corned beef and cabbage and/or sauerkraut and sausage, and always my husband's favorite Lemon and vanilla curd cake (Irish cheesecake)yummy! Oh the Irish Eyes are smiling! Southern Fabric is giving away a $25 gift card! You can pick from an awesome selection...hooray!! No St Patty's traditions. But I have learned to at least wear green! Thanks for the chance at all those great prizes. What's new! Lots of gorgeous new spring fabrics including additional quantities of April Showers pre-cuts and other fabrics that have you looking towards spring! Also remember free shipping always with purchases over $50. 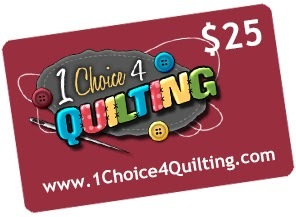 1 Choice for Quilting is giving away a $25 gift certificate! Do you have any traditions for St. Patrick's Day? Leave a comment with your answer, you'll be entered into ALL four giveaways. Entries accepted through Monday 11:59 PM MST. Thank you to you and your sponsors! No, I don't celebrate St Patty's day. No big celebrating here either for St. Patricks Day. I have a friend who is from Ireland, though...she goes all out and enjoys it thoroughly. Thank you for this chance. I don't really do anything for St. Patrick's Day except making sure my children wear something green so they don't get pinched at school. Corned beef! Why is this the only time we eat it? Thanks for the chance. No traditions for St. Patrick's Day. My children know the story and will wear green so they won't be pinched, but that's about it. I always forgot to wear green when I was in school and paid dearly for it. Ouch. Once a year I make corned beef, soda bread and we have creme de menthe cake for dessert. We usually make corned beef and cabbage, and try to wear something green. These are some great giveaways! Thanks so much for the chance to win! I do not as an adult but when I was a child we always had corned beef, cabbage, and carrots for the day! I'll wear my green shirt & shop for some green fabric! We celebrate two birthdays for St. Paddy'ys Day! Our niece turns 13 this year, and my childhood friend, Cindi, spends this first birthday Home. Cindi died right before Thanksgiving last year and leaves two small daughters behind. This is a bittersweet day for me. But I will celebrate Life on this holiday and rejoice in knowing these two beautiful souls! I live in Norway, and we have no tradition of St. Patrick's Day. But I love a nice giveaway. Thank you! no St. Patrick Day traditions for me, but my kids love to party with their friends! Thanks for a great giveaway. Yes I will have my kids over for corned beef and green food. I also made a new St Pattis day table runner this year. I love decorating for all holidays. Dressing up in something green on St. Patrick's Day. Thank you for a great giveaway. We always wear at least one item of green!! We had not really done much on St Patricks Day. I do try to wear a little green to let others know that I want to encourage their fun. I live in Russia, and we have no tradition of St. Patrick's Day. But I know that there is a national holiday. Thank you! We typically make some festive green or Irish-ish food or dessert, but not always the same thing year to year. It's not quite a tradition, but I think I might start trying to do something special for the kids as they grow up. No traditions, aside from wearing green! Pre-kids we used to have a St. Paddy's day party every year, but I now admit it sounds like too much work. Thanks for the chances. We always wear green, bake scones, make our own Irish potato candies and try to have a Guinness in there somewhere! Happy St. Patrick's Day to all! Slainte! I don't have any St. Patrick's Day traditions except making sure I get a shamrock milkshake from McDonald's. I love those! No big celebrating here, though I do wear green. Thanks for the great giveaways! Oh my! What FANTASTIC prizes!! for St. Patrick's Day, we watch a Veggietales short about St. Patrick which is part of their Sumo of the Opera video - it is a silly way for the kids to learn a bit about St. Patrick. I also bake Irish Soda Bread :) thanks for the fun giveaway! corn beef and cabbage and boiled potatoes and a shot of whiskey With good friends. No traditions. I did not wear green as a child or young adult because I look terrible in green. LOL Besides I always believed only the Irish should wear green on St Patty's Day. Thanks for the give aways. We don't have any St Patrick's Day traditions, in fact I'm lucky if I actually wear green! But there are a few things that I wish I did- like make Irish Soda bread, and I've never even tried corn beef and cabbage. Maybe this year! sad to say ~ no traditions :( we are so boring! Being half Irish on my mother's side St. Patrick's Day is my holiday and we go all out with an Irish American feast. They don't do corned beef and cabbage in Ireland you know. We love Cole Cannon around here any time of year. Thanks for the chance at the give away. Absolutely....the traditional dinner with all the trimmings. I even make fudge shaped into mini potatoes for dessert. I don't currently have any St. Patrick's Day celebrations in mind. But need to check in with my Irish friend... Who knows? Thanks for this giveaway. For St. Patrick's day we have corned beef and cabbage with my husbands family :) Thanks for the chance to win! we are not irish, I have always wanted to drink green beer but, I don't really like beer. works great on a long arm too. We always have a special meal and play some Irish music that I was raised with. My favorite treat to have is Irish coffee. Thanks for the chance. Theresa E.
We don't celebrate it - it doesn't seem to feature much where I am! Thanks for the great giveaways. We don't really have any traditions other than wearing green.....of course!!! I do make green milk for the kids. I don't really have St. Patrick's Day traditions, but my family owns a winery and we die one of our white wines green for the day, which is pretty fun! Corned beef and cabbage and wearing a bit of the green are my traditions. The only St. Patrick's Day tradition that we do is that my son and I will wear green t-shirts. That's about it. Thanks for the chances to win the awesome giveaways! No traditions. Just wear green, and remember to call my sister for her birthday. Nope, no St. Patrick's Day traditions for me. Only green beer around here! If our local Grange has a corned beef and cabbage dinner we sometimes go to that, but other than that it's not something we make a big deal of. I put rainbow streamers all over the house with little treasures at the end for the kids to find. We dye our milk green as well. I have a kindergartener this year and will be making a leprechaun trap this week. Heh. It's the anniversary of my gall bladder removal surgery. I eat a little more gratefully and mindfully that day, but not because of St. Patrick's...and no traditional St Patrick's day foods. I always wear green! But I always made my kids something green for breakfast, green pancakes, green biscuits, green koolaid... Got to make life fun! We don't have any St. Pat's Day traditions, though if The Quiet Man is on TV, I try to watch it. Thanks for the wonderful giveaway. No plans. We rarely do anything for St Pats day. Thank you for a chance to win! No St. Pat's traditions. Though I try to wear some green (if I remember). I have 2 ginger babies, so St. Patrick's day is definitely recognized in our home. Of course, we all wear green, my son likes to put on his Irish accent for the day (which isn't too bad) and I usually cook up some green treats. Another thing we sometimes do is make Leprechan Traps from old boxes and recycled things. We don't go all-out, but we have fun. Sorry to be Debbie Downer, but I don't have any St Patrick's day traditions, unless you count keeping the cats inside. It's usually just another day for me. If I remember in time, I make a chocolate guinness cake. I wish I remembered more often than I do, as it's a great cake! Being of German descent, we don't do anything to celebrate St Patrick's Day. Occasionally wear green if I remember. Honestly I would be thrilled to win any of the one's mentioned in your blog... if I had to pick one it would be the Connecting Threads bundle. I already use their thread (which is fantastic!) but would love to try their fabric. Thanks for the chance to win. Of course! We decorate the house, I make soda bread and we go to the Irish parade! I try to remember to wear something green, but otherwise, I don't celebrate St. Patrick's Day. Every year for St. Patrick's day I have a little party, and I make my corned beef and a potato cabbage bake. And of course some Guinness cupcakes with baileys frosting. I love St. Patrick's day. So much fun. Thanks for the chance to win. The only tradition is celebrating my mother's birthday which falls on St. Patty's Day. We use to have corn beef and cabbage every St. Patricks' Day. Then, many years ago I got one of "those" phone calls while prepping our dinner. My husband was in the hospital, and in bad shape. Everything worked out fine, but I haven't cooked Corn Beef and Cabbage, since then. With a Dutch heritage and growing up in a Dutch community, I never knew about St. Patricks Day until my daughter befriended a girl who loves St. Patricks Day! So, no, there is no celebration in my life but it always surprises me how big of a holiday it really is! Not much of a St. Patrick's girl myself. My mother always made corned beef and cabbage, so there may be a corned beef sandwich that day! Thank you for sharing such great giveaways. Many years ago, we did lots of celebrating, including green beer, but now it is just a matter of enjoying seeing the Quilty projects people make! No traditions for us. Thanks for the giveaway opportunities! No traditions for the day at all. Have to wear something green - years of public school pinches if we didn't! Drinking green beer and wearing green of course! Happy St Pats day. Thanks for the chance to win. Have to wear something green! Wear green or get pinched! We don't really do anything for St Patrick's Day. We do hear stories of celebrations from our son who lives in New Orleans and always finds parades and parties to celebrate the holiday. Well, in New Orleans, almost any holiday has that. We don't celebrate St. Patrick's Day. We stay away from "Aggieville" - the business district near the KSU campus - because that's where the students celebrate the day. Bake some Irish soda bread (double the recipe so I have some to put in the freezer! ), make a corned beef & cabbage ... and enjoy! thanks for the chance! We don't really do anything to celebrate St. Patrick's Day in our family. Thanks for the lovely giveaways. Sometimes we wear green, but it's not required! The only thing I do for St. Paddy's day is to be sure to wear green. This year I picked out a new blouse for work to make sure I am not running around trying to find one. I usually wear green and play some Irish music, but that's about it! I try to wear something green to celebrate the Irish but otherwise no . Thanks for the chance . No celebrations for St. Patrick's Day at my house, but I always wear green to work. Thanks for the chance at the giveaways! I do not celebrate St. Patricks Day! Thank you for the chance to win! We wear green, of course, because kids are mean and will pinch really HARD if you're not wearing it...ask me how I know...I always make corned beef, cabbage, potatoes too. I make that several times during the year but it's extra special on St. Paddy's Day! Our tradition is to spend the day with my GMIL, it is her birthday. No particular tradition now but during the several years my daughter was a competitive Irish dancer it was a day to take her out of school to put on dance performances around town. The only thing I do is make sure I wear green on that day. I don't celebrate St. Patrick's Day. Thanks for the spectacular give away! Have never done anything special for St. Patrick's Day until this year. I have a granddaughter now, so I spent the day putting an appliqued shamrock on a onsie and also made a little skirt. Special days are more special to me now. The only thing we do is eat corned beef and cabbage. Thanks to you and your sponsors. We don't really do anything special, although I do try to wear green and I have a "Kiss Me I'm Irish" button!! Thanks for the chance at this great giveaway! Two of my daughters love Shamrock shakes and they celebrate St. Patrick's day as long as they are available. Thanks for the chance to win!!! Thanks for the opportunity. We don't celebrate St. Patrick's Day, but I do try to wear green so I don't get pinched!!! No we don't have any specific traditions for St Patrick's day, though it is usually my pre-birthday celebration day since it is the 18th :). Just wearing green and maybe a beer in the evening. Thanks for the chance to win! No I don't celebrate this holiday. Just another wonderful day for me! Thanks for these amazing opportunities to win! WoooHoooo! Where I come from most people don't even know about this holiday, so no, no traditions here. I don't celebrate St Patricks Day but I have a funny story. My friend had a St Patty's party one year. She handed me a sheet of Irish jokes. After no one laughed at the first couple she took the sheet back. Apparently a Texas accent ruined the jokes! I pretend I'm Irish, put on some Van Morrison, and wear green. My red-haired Irish grandmother was born on St Patrick's day. Quite a serious honor. We mostly each corned beef and potatoes and be grateful for the good health that comes from an Irish farmer background. No traditions anymore. My kids are gone but when they were home they got green eggs and ham for breakfast and all sorts of crazy food all day. When my kids were small we died the milk green, had Lucky Charms for breakfast,. There would be green footprints and a little mess left. Then we changed to corn beef and cabbage sandwiches for dinner. My husband and son just loved it. This holiday is not celebrated in the Netherlands, sorry! In the shops everything is geared towards Easter already! Little bunnies everywhere, ha ha! Thanks for a great giveaway. We don't celebrate St. Patrick's Day. St Patricks day is one of my best friends birthdays. So we usually throw a st patricks day/birthday bash and have a lot of fun! And I usually treat myself to a McDonald's Shamrock Shake too. Did you know that originally they were only vanilla shakes with green food coloring? People would swear they were mint, but they weren't (according to my BFF, who was a champion McD's shake maker!). My mums 80th birthday this Paddy's day. That is all we have ever celebrated. (her birthday).but I think I can remember getting the day off from school to have a Patrick's day athletics carnival. I admire your work and I am a great fun of you for years. I live in Athens, Greece and I don't know if I can join your activities, but I would like it very much as I can't find here in Greece all these amazing stuff you giveaway. We don't celebrate St Pattrik here and it is not a common name. Thank you for your tutorials and your great ideas. No traditions for St Patricks Day. It gets crazy in town, so I guess my tradition is to try and avoid that!! Haha don't I sound old?! We wear green and have corn beef and cabbage. Thanks fir the chance! I plant sweet pea seeds ready for spring. My youngest daughters school allows casual clothes for the day but they all have to be green. I live in Boston where St. Patricks Day is big day for celebrating whether or not your Irish. So wearing green, eating green, or having a green drink is usually in the plans next weekend. Thanks for the giveaway. No traditions here but do enjoy seeing what other people come up with. Wonderful giveaway, Thanks. I make corned beef and cabbage. We don't celebrate St. Patrick's Day but I loved celebrating with my Irish friends big time when I lived in London. Drinking green beer of course!!! We wear the green in our little hamlet. I don't celebrate ST. Patrick's Day. Several years ago I went to a St. Patrick's Day Parade and as you walked up and down the street people had there homes opened up for you to come in and have a drink and something to eat. It was very interesting. Thanks to your sponsors for the great giveaways. I love St. Patrick's Day, but sadly don't live near any big celebrations. My husband and I always make an Irish themed supper (usually corned beef and cabbage) and of course proudly wear our green. I don't celebrate St. Patrick's day except to wear green. Thanks for the great giveaway! We don't do anything in particular except decorate and then send special wishes to my brother in law b/c it is his birthday! I really don't celebrate St. Patrick's Day. I just make sure my husband and I wear green. We hate to be pinched. Wow! Love the giveaways, and love St Patty's Day! My classroom is filled with Shamrocks...and I always have the children do something fun - related to the holiday! At home, a good corned beef with some Irish Soda bread for dinner - and I have been known to drop a small splash of green into the beer!!! We really don't celebrate St. Patrick's Day - we are more the type to celebrate Pi Day on 3/14 - or this year Pi Month... yeah... geeky house! When my children were small we were visited by a leprechaun. He would turn our milk green, switch the comforters on their beds, and do other little pranks. Now, unfortunately, the children are up much later than the leprechaun so he can never surprise them! We do decorate and wear green and have a nice corn beef and cabbage dinner! Thanks to your sponsors for the great prizes. The only tradition I have is I wear my shamrock socks all that week. I have ten pair. I have a funny leprechaun hat, and every year I take a photo of my grandson wearing it. It is so fun to look at the photos of each year as it gets smaller and smaller on the top of his head! We celebrate the birth of my second grandson who was born on St. Patricks Day in 2011. It also happens to be his father's birthday so there is lots of green in the house! My nail lady wears orange, in rebellion against st. Pat.?! Since I'm getting my nails done on the 17th I'll have to ask her to explain why again. Thanks. We don't do anything nowadays - when I was a student we would have a few drinks! Thanks for the giveaway! We make corned beef and cabbage and Irish soda bread. We do celebrate - eating Irish food and my house is decorated with place mats, an Irish table topper, a lighted shamrock in the window and I even war St Patrick's day socks and a green blouse. I just wear some green! I have red hair, but I am just not that into St. Patty's Day! No, I actually don't! I grew up in Indonesia and we don't celebrate St. Patricks day there so I have never grown up with it, hence no tradition. So what my husband and I likes to do is add green food coloring in cream soda sometimes. Thanks for the chance to win this wonderful entry. I'm not Irish, but wear green on St. Patrick's Day, and always serve corned beef and cabbage. Traditions are nice to participate in and continue! I always make sure to wear green. Yes, our ST. Pat's day is a corned beef dinner and all the trimmings at the local Sr. Center Complete with green beer! 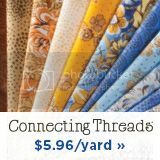 I love Connecting Threads fabrics and prices! Great time in Tampa Florida watching the river turn green! I always make green pancakes! My youngest son was born on St Pat's day, so that makes it doubly special since my father's family was Irish. We always include something chocolate for favours and some decorative green hats on his cake. I try to celebrate the holiday with a green milkshake, mint chocolate chip ice-cream and vanilla syrup. It's a favorite of mine. wonderful giveaways! The gray connecting threads bundle would go a long way in a quilt I currently have in the works; I saw their new verigated threads the other day and love those as well. I don't have any St. Patty's day traditions. Don't celebrate it much just a couple of decorations I put up for my Granddaughter she says she feels sorry for St. Patricks Day because nobody celebrates it lol. Green, green, green!And of course my husband wants his corned beef! Corned beef and cabbage, hot cross buns, and wearing green. No-we don't celebrate St Patrick's day, but thank you for the wonderful giveaways!! I have to make sure I have something green on so that some smarty doesn't pinch me. No traditions here, although sometimes I will wear orange to spark a discussion about past religious strife in Ireland. We have always used as many green foods as possible, green homemade bread, green milk, fruits and made green cookies. It's our Granddaughter's birthday so we celebrate her. Sure do! We build Leprechaun traps and try to trap one!